Hinduism embraces a diverse range of beliefs and practices. Like other organized religions, it is also full of contradictions. Some teachings promote loving devotion, or bhakti, and compassion toward all living beings. Others counter that blood offerings, or bali, are compulsory. 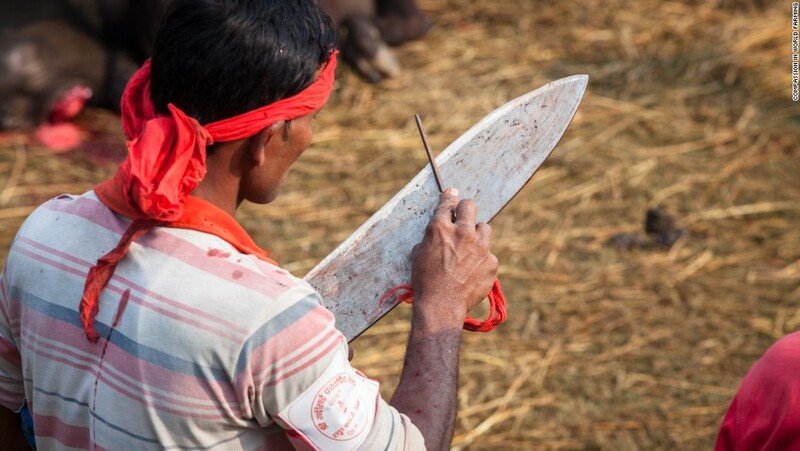 In a religion famous for promoting ahimsa, holidays like Dussehra and the Gadhimai festival are notorious for being large-scale bloodbaths. These practices are defended by certain sects as necessary to appease a fierce form of God. What purpose did blood sacrifices serve? Are they necessary for spiritual advancement? If bali pleases Shakti, why do countries that perform these rituals remain stuck in poverty? How do mystics who avoid animal sacrifice get blessings? Spiritual traditions encourage every individual to put in personal work and effort to make progress toward their own liberation. Yet millions of Hindus are led to believe that sacrifices at Shakti temples bring blessings such as financial prosperity or less hardship in life. If true, why do large populations still suffer in places like India, Nepal, Bangladesh, and Pakistan? Wouldn’t annual sacrifices automatically bring generations of good luck? Clearly, something isn’t working. In addition, if giving a slaughtered animal is all one needs to get God’s grace, why not teach people how to do it themselves? Most families have home shrines where offerings can be made. Why make people travel by bus or train, or even cross national borders for bali? If people performed this independently, then those in charge of sacrificing would lose out on money. Animal sacrifice tends to be largely profitable for priests, temples, livestock sellers, butchers, event planners, and leather tanneries. In essence, the organizers behind holiday festivals make money, while not much changes for paying customers. Some Shaktas insist that Kali, Durga, and others Goddesses are “bloodthirsty” and need sacrificial killing. This doesn’t explain the large number of Hindu and Buddhist mystics in India, Nepal, Tibet, Thailand, Cambodia, and other parts of the world who’ve attained communion with female deities through simple veneration (see part IV for more detail). Devis are demon slayers, known for fiercely guarding their devotees. How does a devotee express affection for God? Singing praise (bhajan), chanting her holy name (mantra japa), helping Ma’s children (seva to humanity), or fasting on holidays (vrat). These are all considered acts of self-sacrifice. Take Navratri. The text Devi Mahatmya poetically narrates a nine-day battle between Durga and a supernatural being with shapeshifting abilities named Mahishasura. Mahishasura is described as misusing his power to terrorize the world, eventually taking the form of a buffalo. Unable to defeat Mahishasura, the male deities of the Hindu pantheon (without blood oblation) called on the fiercest form of divinity: Adi Shakti. Durga springs to action, Mahishasura is slayed by her ferocious forms of Chamunda and Kali, and harmony is restored. Here we’re taught of Durga’s protective nature, a mother who shields us from harm if we’re willing to offer our heart to her. In fact, simply reading this text out loud over nine nights is considered an act of bhakti. This story also tells devotees that with the Mother’s help we can destroy our own bestial desires (symbolized by an angry buffalo) of selfishness, greed, and ego and replace it with spiritual qualities of selflessness and inner peace. Durga saved those victimized by terror without asking for any reward in return. Nowhere does the Devi Mahatmya command mass slaughter nor does it describe Durga as having a voracious appetite for buffalo flesh. Mahishasura did not start out as a buffalo though – he started off as a shapeshifting human. And in much earlier times it wasn’t animals led to slaughter, but people. The ancient history of human sacrifice is documented around the world – a disturbing practice justified to assert control and power. Sacrifices described in the Vedas were also carried out for selfish reasons. If a king wanted to expand his empire he would slaughter a horse before declaring war. Clearly this wasn’t done to get closer to God, but to fulfill a very egotistical desire of dominating others. Some Shaktas argue that for Kali “meat is mahaprasad.” What’s ignored is that bali is actually rooted in a long and dark history of human sacrifice. Kali is an ancient deity worshiped and meditated on long before the Vedas were written. Yet as recently as the 12th Century, author(s) of the Kalika Purana boldly declared that “human flesh is mahaprasad.” All book references on human sacrifice were tied to selfish gains such as destroying your enemies or acquiring the ability to manipulate people. There’s no mention of blood rituals leading to spiritual enlightenment, liberation of the soul, or getting closer to God. 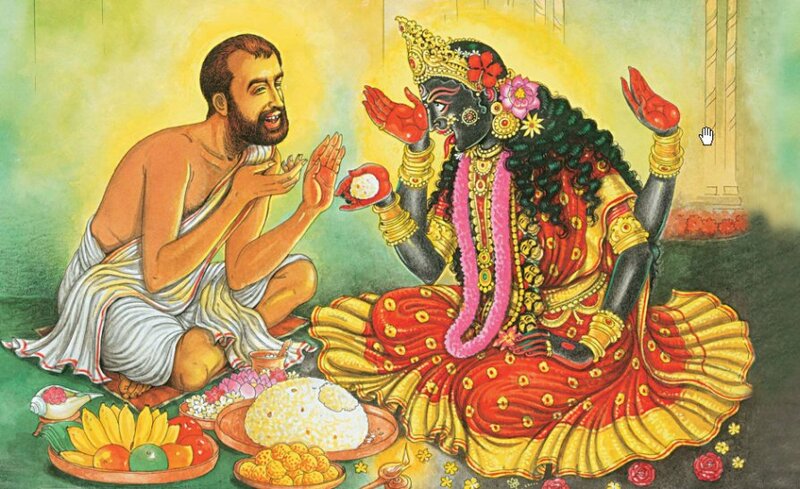 Ramakrishna & Sarada Devi: Bengal’s most famous mystic couple experienced visions of Kali on a regular basis simply by chanting her name, providing service to temple visitors, and sitting in daily meditation. They offered lotus flowers at the feet of Kali’s murti and preached to visitors about experiencing divine bliss. Milarepa: Tibet’s most famous saint and Buddhist Tantric spent years in deep meditation and eventually received instruction from the devi Tara. Milarepa was also known for sneaking into sacrificial ceremonies the night before, untying animals meant to be slaughtered, then hiding them in his cave. Amma: When the Hugging Saint of Kerala meets with large audiences, they collectively chant 1,000 names of the Holy Mother and then perform healing meditation in unison. Amma then channels Kali’s love and energy by hugging people for 12+ hours non-stop without rest. Om Swami: Indian-Australian and businessman-turned-renunciate spent years meditating in a small Himalayan hut. His reward for prolonged meditation was a divine vision and embrace from the Mother of the universe. He now tours the world leading meditation camps teaching devotees how to serve God in everyday life. As the evidence shows, the only offering necessary to appease Devi is offering one’s heart – in exchange she provides her love and guidance. 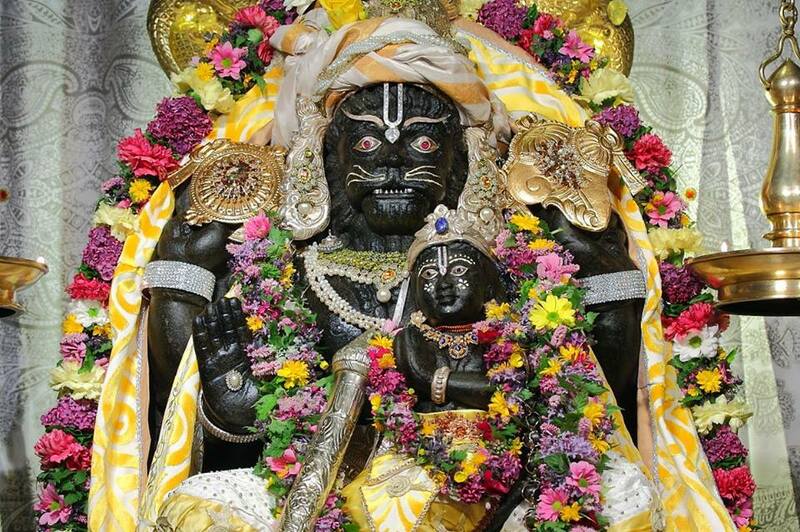 Narasimha Jayanti celebrates the half lion, half man Vishnu avatar and his child devotee Prahlad. Prahlad had multiple attempts on his life ordered by his father Hiranya (known for despising Prahlad’s bhatki). On the holiday marking the event of Narasimha’s protection of Prahlad and killing of Hiranya, Vaishnavas chant Narasimha’s name and offer his murti milk, water, and flower garlands. They are reminded to approach God with the same child-like devotion that Prahlad had. Holika, the sister of Hiranya was sent to end Prahlad’s life by placing him in her lap as they both sat in fire. One version says Holika knew that Prahlad was pure hearted and wrapped her inflammable clothes around him as protection, sacrificing her own life. This event is marked with the celebration of Holi, a festival where people throw colors and spray water at each other. Kamsa, the cruel king of Mathura ordered multiple shapeshifters at different times to kill his maternal nephew Krishna, a village cow herder. Krishna killed beings who took the forms of a serpent, a buffalo, a bird, a donkey, and even a calf (yes, a baby cow!). Eventually Krishna made his way to the royal palace ending Kamsa’s reign and restoring peace to the kingdom. All Krishna-related holidays are celebrated with the offerings of sweets, playful reenactments of his childhood, and chanting and singing throughout the night until sunrise. Yellamma, also known as Renuka, is the story of a housewife beheaded by her husband’s orders when he flew into a fit of rage. Her son Parashurama used a supernatural boon to resurrect his mother. Because of Yellamma’s lifelong devotion to Shiva, she was divinely rewarded and transformed from ordinary human into a goddess assigned to help those in distress. 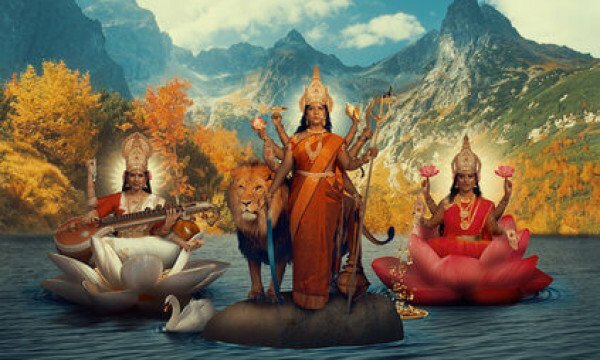 Even though these accounts illustrate acts of violence toward people and various animals, they always emphasize God’s divine intervention and the principle of bhakti. Orders to spill blood or recreate killing on holidays are nowhere to be found. Sacred texts of different religions reveal stories of prophets and mystics making spiritual gains through self-sacrifice and bhakti, not blood sacrifice. Repeatedly these books emphasize prayer, meditation, fasting, pilgrimage, service to humanity, living modestly, and other forms of devotion. The same lesson is repeated over and over: engage in self-sacrifice and God will offer divine guidance. Those actively seeking God or trying to better understand Hinduism should not take a blind faith approach. Research the history behind bali and its roots in human sacrifice. Consider experimenting with bhakti and self-sacrifice. It may be what uncovers the veil shrouding us from the Divine Mother.